This is chapter three. Chapter one is about the books I read until the age of eleven or twelve, and chapter two continues the story until my later teens. This is the third and final chapter. I like books because I like reading them; this is so obvious it’s not worth saying. But there’s a lot more to it than that. Books contain the world, both in the sense of having the sum of the world's knowledge contained within them, and in the sense of controlling or limiting the world, as a disease or explosion might be contained. This seems to suggest that I regard the world as threatening or dangerous, as something to be kept at bay, which I don’t think is true, or at least no more true for me than most others. Because of course everyone wants, to a greater or lesser extent, to control the world; to control their world, anyway. Doing so makes it safe, or safer. Books impose an order on the world, and thus control it. The world is sprawling and messy and sometimes ugly; books tidy it up, tell it to pull its socks up and wipe its nose and make it altogether more beautiful. I like books because I like beautiful things around me. Books can be beautiful in the sense that they contain beautiful words, pictures, ideas and so on, and in the sense that they are often physically beautiful objects. The satisfaction of a well laid out page of text in a dignified and attractive font. The richly intimate inky smell of a new book, or the slightly musty smell of an older one, hinting at past readers and their lives. The crackle as the stitching gives a little when first opened. The smooth or textured touch of the paper and the weight and solidity of the cover. (Don't worry, I don't get my kicks by going round stroking and sniffing books, but their physicality, and in particular their tactility, is one of several reasons why various electronic devices, excellent though they are in their way, will never completely replace books.) The quest for beauty is obviously another manifestation of the universal desire for control. We want to shape the immediate world to our own tastes. Some cultivate their gardens, at great expense of physical effort and probably financially too, to bring order to their own little patch of ground; I cultivate my library. Writing had been around for more than three and a half millennia when some genius finally came up with the idea of books. Books (i.e. codices, series of flat sheets hinged along one edge, as opposed to scrolls or tablets) are one of the world's great inventions. They tend not to appear on lists of the top ten inventions (the printing press usually does, rightly so, but would have been of much less practical use had the book not been invented first), probably because it's hard to think of them as needing to be invented, as if they've just always existed*. In fact, books were invented by the Romans, perhaps in the first century CE. Coincidentally, paper was invented, in China, very soon after (in the early second century CE), but it seems that books made of paper (rather than, for example, parchment) didn't appear for well over a thousand years (at least in the West; I'm not sure about the East). Like all familiar things, it's very easy to take books for granted and to fail to fully appreciate them, but think about them afresh for a moment and wonder at their brilliantly simple, effective, elegant design. They can store an awful lot of readily accessible verbal, numerical or pictorial information in a relatively small space, and what's more they look and feel great. (Computers obviously do the storage even better, but they're never going to look or feel as good.) A shelf of books is an asset anywhere, giving a civilising touch. 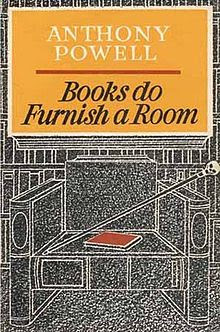 Books do indeed furnish a room. William Golding (1911-93) is an author who seems to be relatively unfashionable now (perhaps the inevitable fate of most writers in the several decades after their deaths, though almost all his books are still in print), and consequently I’ve been able over a period of few years to build up an almost complete collection of first or early editions of his books without spending much money. Missing from my shelves are the very early Poems (1934), which would cost several thousand pounds (for a slim pamphlet), Lord of the Flies (1954), and his sole play, The Brass Butterfly (1958) (though I've got a paperback of the latter). Lord of the Flies, his first published novel, retains its kudos, and so it's impossible to find affordable early editions (not just first editions, first impressions, but all impressions) in their Anthony Gross dustjacket. Fortunately, having taught it so often that my pleasure in it, great book though it undoubtedly is, is utterly exhausted, I never want to read it again, so I’m fairly sanguine about its absence from my library. If I did ever come across a cheapish copy I would buy it, though, not to read but just for the pleasure of seeing it next to The Inheritors. I realise that many will find this odd or worse, and I have to admit I have a lot of sympathy with this view. I’d still buy it, however. 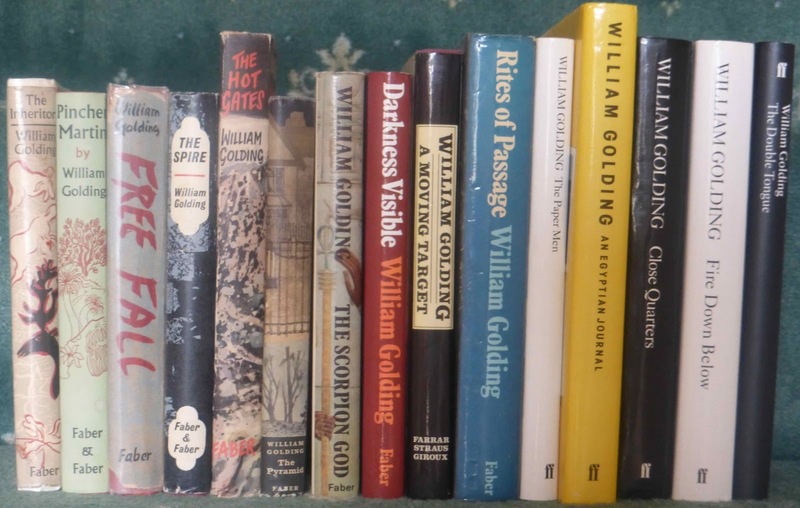 I like the fact that Golding’s most considered words are immediately available to me, compactly and pleasingly presenting themselves on my shelves. 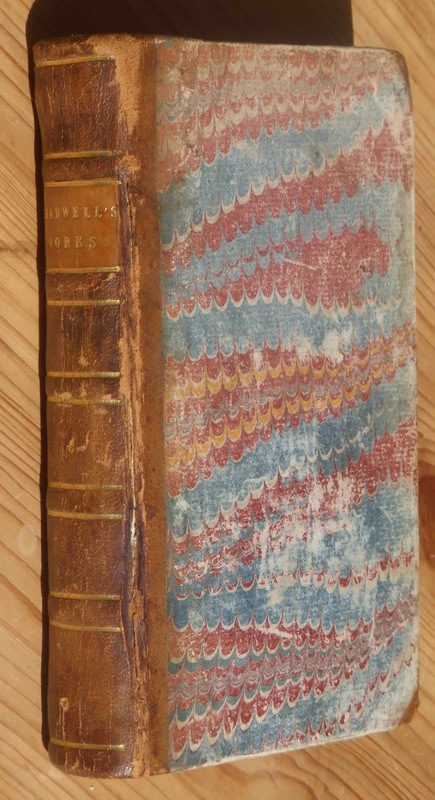 Each narrow spine promises a wide wealth of words. 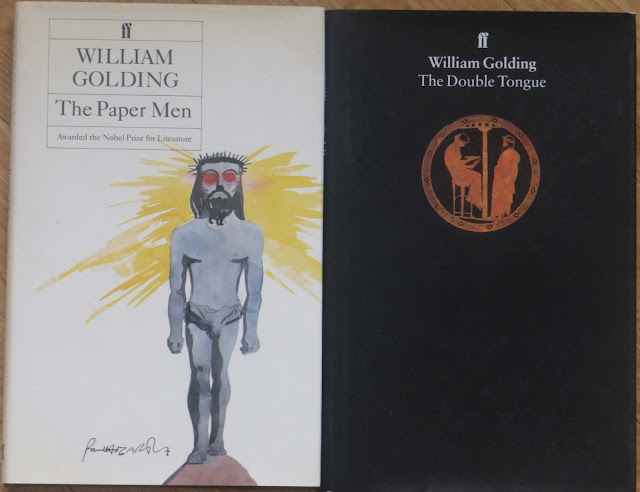 The Golding sequence excellently illustrates my point about the beauty of books; almost every one is a satisfying artefact, with a cover design by a prominent artist. Darkness Visible is printed on horribly cheap paper (it’s less than 40 years old but already it’s badly yellowed and seems on the verge of crumbling to dust), but nevertheless I very much like them as a collection (as well as, obviously, individual books). 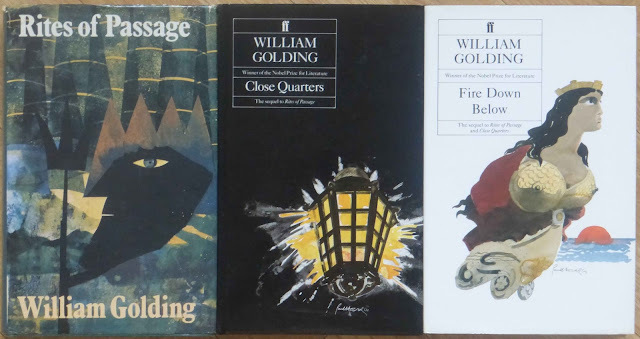 His first four novels have jackets by Anthony Gross (1905-84). 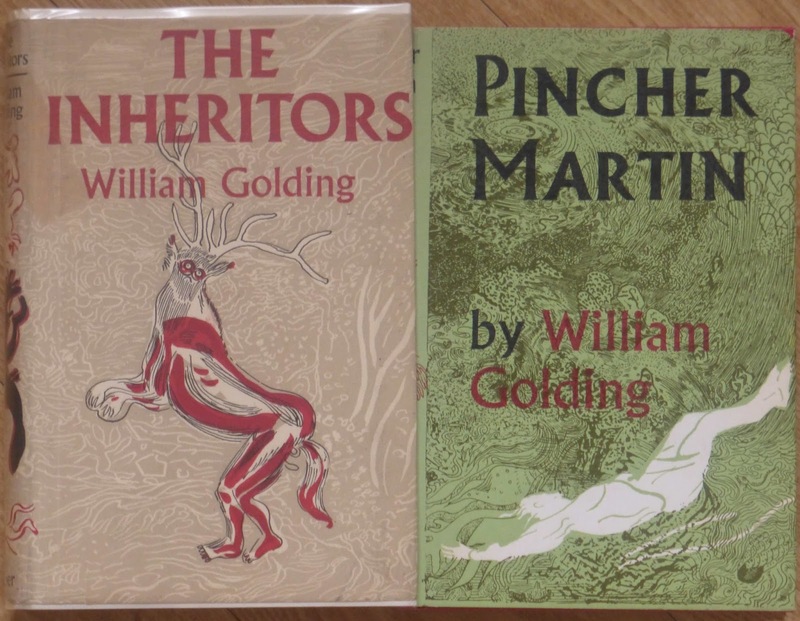 The Inheritors is from 1955, and Pincher Martin from the following year. Free Fall was published in 1959. 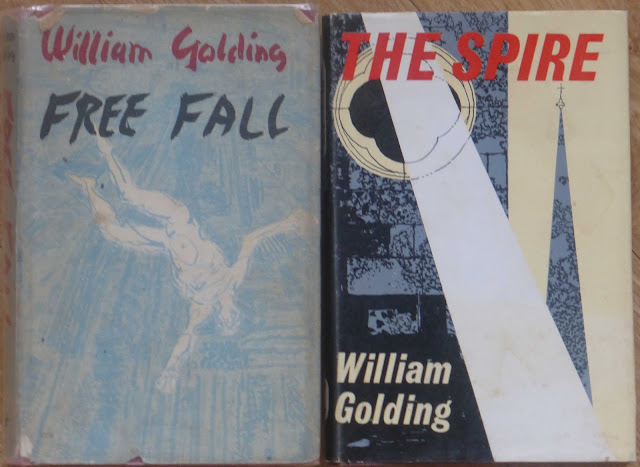 I don't know why Gross didn't get the job of designing the cover of The Spire (1964); it went instead to John Piper (1903-92). 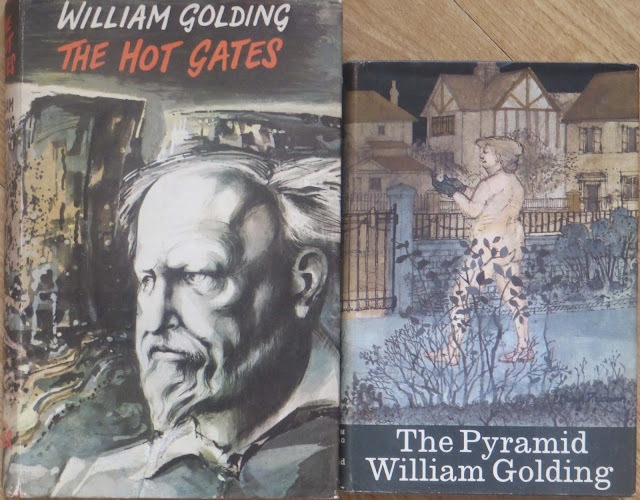 The cover of The Hot Gates (1965) (a book of essays) is by Michael Ayrton (1921-75), and that of The Pyramid (1967) by Leonard Rosoman (1913-2012). 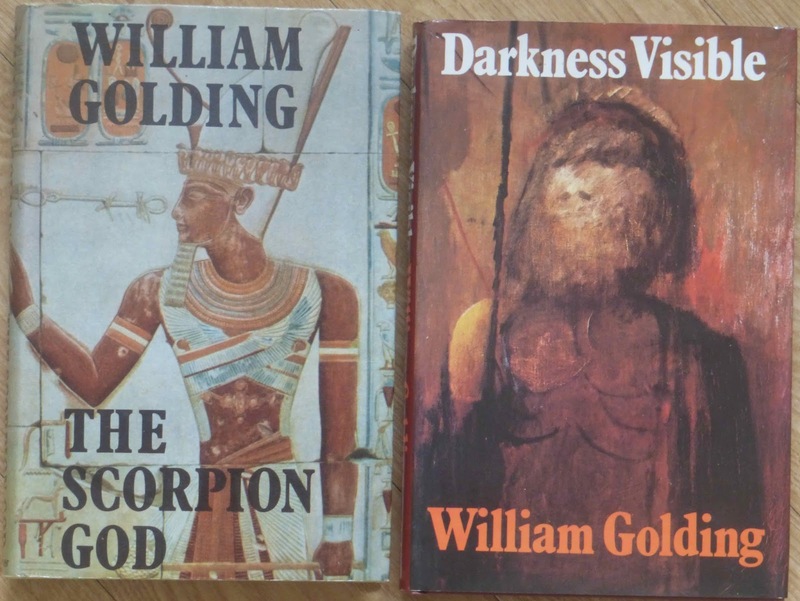 The cover of The Scorpion God (1971) is uncredited, but obviously incorporates an Egyptian tomb painting. That of Darkness Visible (1979) is from a painting by Russell Drysdale (1912-81). The cover of The Paper Men (1984) is by Paul Hogarth (1917-2001), and that of the posthumously published The Double Tongue (1995) incorporates a picture from Athenian red-figure pottery. Rites of Passage (1980), the first volume of the trilogy later titled To the Ends of the Earth, has a cover by Cathie Felstead (b.1954), who Wikipedia tells me was born and lives in Hertfordshire. It must have been a great boon to her career to be commissioned to design the cover for what turned out to be a Booker Prize-winning novel in the year she graduated from the Royal College of Art. I like her work, but it's a shame that one artist didn't design all three covers. The other two (1987 and 1989) are by Paul Hogarth. I have a more or less complete set of Pevsner’s Buildings of England (only more or less complete because, while I have got volumes covering every county, I haven’t got all the latest revised editions). They make a fine sight in their black-spined dust-jackets, occupying the best part of two yards of shelf space. They’re not quite uniform as, as well as being two different sizes, the original Penguin volumes have sans serif titling in a variety of colours (written the ‘wrong way up’ on the spine, that is, so that when the book is face up the lettering is upside down; why are spines ever lettered like this? ), while since about 2000 the larger volumes published by Yale have white serifed titles (the right way up). I’m not quite sure if I’d prefer the set to be fully uniform; on the whole I think I like its diversity as this reflects the capricious variety of the country it so comprehensively delineates. 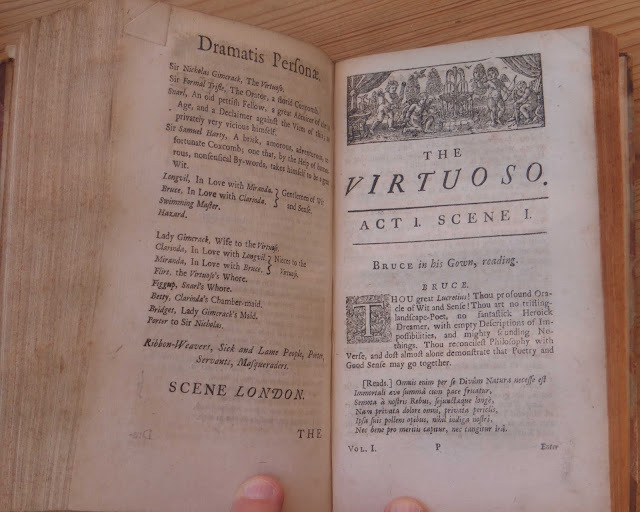 The books are attractively designed and produced, with the exception of the central pages of photographs which are too small, too grey and often unimaginatively composed (the Yale volumes are better). The books are of course a cornucopia of knowledge and information, and I wouldn’t contemplate going on a journey without the relevant volumes accompanying me. This is only part of the reason I like having them, though. I very much like the sense of ownership they give me, as if the buildings and places they describe belong to me (which they do in a way, since they’re the common heritage of the inhabitants of these islands), and I belong to the culture that created them. On reflection, I think this is a large part of the reason I like all books: they make me feel that I’m an integral part of the world. Having Golding’s books on my shelves is as if I’m responsible for them, in the sense that it’s the next best thing to having written them myself, and in the sense that I have a duty to preserve them and the civilisation that created them. I realise that this is erroneous, pompous and ridiculously self-regarding, but nevertheless it contains a large psychological truth. 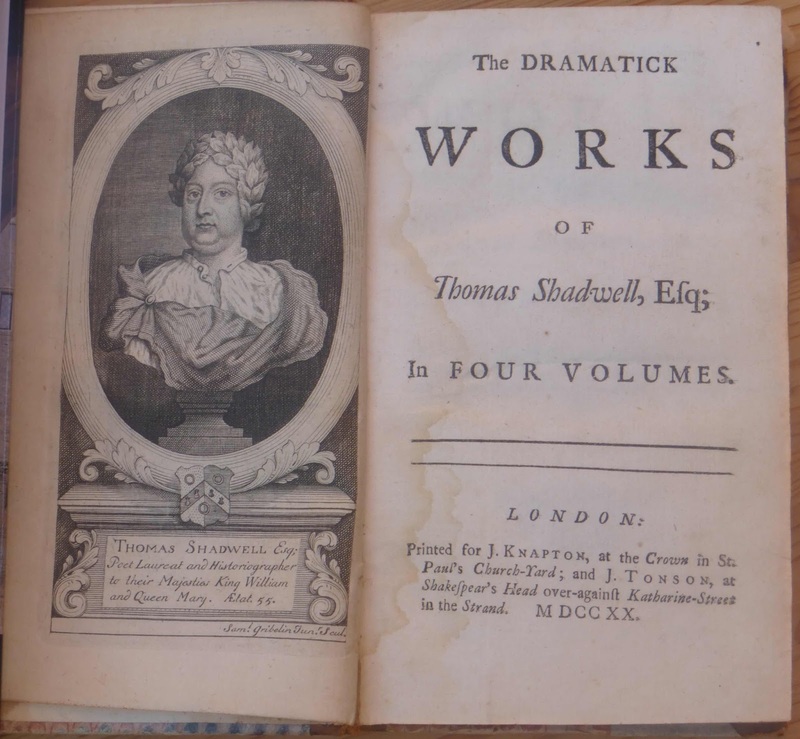 This is volume one (the only one I've got, of four originally published) of The Dramatick Works of Thomas Shadwell, Esq, published in London in 1720. I've had it for decades; it's of little monetary value, being a stray volume from a set (Abebooks has the four volumes from £265, though if I sold this solitary book I'd be lucky to get a tenner). Thomas Shadwell (c.1642-92) is generally considered not much more than a footnote in the history of English Literature. His plays are very rarely performed and his poetry hardly read (though his lyric 'Nymphs and shepherds, come away' survives because Henry Purcell set it to music). I've read a couple of the four plays in this volume, and I'm not going to claim that he's an overlooked master (but he's certainly not without interest - I rather enjoyed The Virtuoso, a satire on science and scientists - and deserves better than posterity's neglect). Nevertheless, I like the book very much. I like the marbled boards, their worn patches telling of innumerable past perusals, of being taken from and put back on shelves dozens, hundreds of time over the centuries. 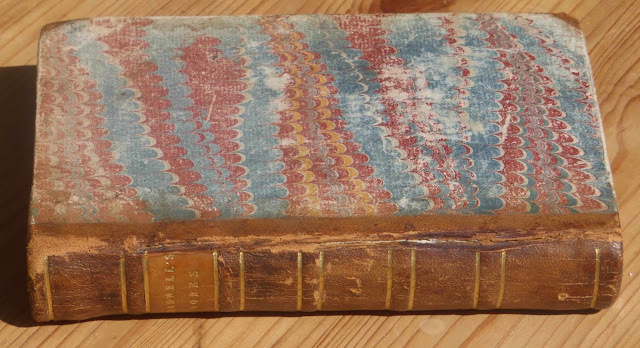 The seven raised bands, outlined with gilt, of the spine give the volume a touch of swank and swagger. The little headpiece woodcuts try to do the same, but despite their pretensions they're cheerfully rustic. 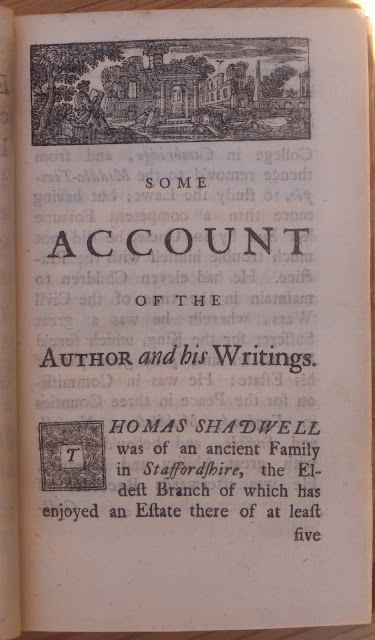 The text is set in a very sturdy font, which is not however without whimsy - see the little flourishes on the italic capital Ds in the words 'Shadwell' and 'London' below, for example. The typesetting is a little uneven, evidence of its being laboriously done by overworked printers straining their eyes in cramped workshops. Like all paper books published before the invention of wood pulp-based paper in the 1840s, the paper is rag-based (i.e. made from textiles such as cotton and linen). This gives the pages a delicious almost creamy colour and a wonderfully crisp texture; rag-based paper also lasts much longer than some paper made from wood. This book has survived almost 300 years; it's just about as readable and attractive now as it was when it was first printed. I like the sense of history it embodies, all the past readers and owners, all the happenings it's witnessed. As long as it's treated tolerably well it will last for another 300 years, and more. This is the final triumph of books over electronic devices. Data stored on computers will become inaccessible as technology moves on, while books will remain readable for centuries, probably even millennia. I've got some old floppy discs with things I've written over the years stored on them; even though they're not much more than a decade old, finding the equipment to read them would be difficult. I could, if I tried hard enough, extract the data now, but what about in ten years time, or fifty? Computers will have moved on so much that it will be impossible. We all have photos on our phones and laptops, which no doubt we'd like to look at in decades to come, and our descendants would want to see in the further future. But these photos will effectively disappear as the technology storing them becomes obsolete. Future generations will have better access to family photos from the 1910s than they will from the 2010s. The classic example of this technological obsolescence is the Domesday Book project of 1986. The original Domesday Book was completed in 1086, and its parchment pages are entirely legible (and beautiful). It's lasted for 930 years so far, and is still going strong. In 1986, to celebrate its 900th anniversary, a project to compile a modern version of Domesday was finished, and stored on what was then the latest technology, laserdisc. Since then laserdiscs have been replaced several times over by better devices, and the hardware necessary to read them has been discarded. So the 930 year old book is near enough as good as new, while the 30 year old technology is useless. It's true that efforts have been made to successfully retrieve the data, but it will have been stored in another format which will inevitably become obsolete in its turn, and in a lot less than another 30 years will be once again inaccessible. The only long term solution is to print the text and still pictures (books admittedly aren't of much help with moving images) and store them in books. The two thousand year old technology wins hands down. Pixels are poxy; paper is powerful. No wonder I'm intoxicated by the possibilities offered by books; I'm drunk on ink. 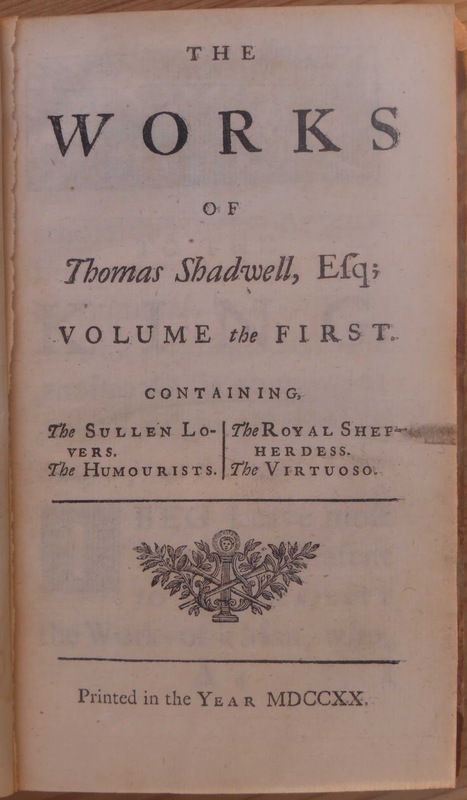 When I wrote the first version of this essay a few years ago I wanted to put a suitably bookish epigraph at the top, and I thought of a quotation from Shakespeare that I remembered seeing on a poster in the English department at a school I taught in once. I remembered it as something like ‘I pity the poor fellow who has not drowned in ink.’ I realised this wasn't absolutely word perfect, and I couldn’t remember the next phrase, which was another metaphor about being absorbed by reading (‘wrapped himself in paper’, something like that), and I wasn’t sure which play it came from, so I emailed my friend Robert who worked at the school to check the details. He replied that neither he nor any other member of the department had any memory of such a poster. A quick check in a concordance revealed that Shakespeare never uses the phrase ‘drowned in ink’, or anything like it. What’s more, a Google search drew a complete blank; not only had Shakespeare not written these words, but apparently no one else had either. Had I just made up the quotation, or was I half-remembering something I’d seen or heard elsewhere? If I'd had the gumption to search the concordance for 'ink' rather than 'drowned' I would have solved the conundrum far more quickly than I did. (And if I'd stopped to think sensibly for a moment I'd have realised that drowning by definition means having too much of something, and so drowning in ink couldn't possibly be a good thing.) My memory had seriously garbled a quotation from Love's Labour's Lost, which is about drinking ink, not drowning in it. His intellect is not replenished; he is only an animal, only sensible in the duller parts. None of this solves the mystery of whether there was a poster in the English department with a quotation from Love's Labour's Lost. Did I just imagine it? Having taught English for 36 years it shouldn’t continue to surprise me that so many people get no pleasure from reading, but it does. I've spent hours over the last few years in hospital waiting rooms, and I've observed that about ten percent of people will be reading a book, another ten percent a newspaper or magazine, and maybe twenty or thirty percent will do things on their phone or other electronic device (which perhaps includes reading). Which means that at least half of them choose to sit, sometimes for hours, apparently staring blankly into the middle distance. This baffles me; why don't they read something? (I suppose part of the answer is that they feel the same way about reading novels as I do about reading the small print on credit card agreements.) Yet maybe they’re usefully mulling over their lives, effectively meditating, as they sit seemingly doing nothing. Maybe it’s me, with my horror of being stationary anywhere for more than a minute without something to read (a characteristic my son has inherited), who is to be pitied for my lack of self-sufficiency and inability to use such times for healthy introspection? Well, maybe; but I'm going to continue to eat paper and drink ink. * Ink, a vital but easily overlooked ingredient of books, also needed to be invented. Apparently it's been invented independently by many different cultures at different times, but the Chinese got there first in the 23rd century BCE. ** Nathaniel's words are about having drunk ink, not being made drunk by it, and I've consciously misquoted them in my title for my own purposes. *** Later in the same scene Dull calls Nathaniel and Holofernes (a schoolmaster) 'bookmen', a word the Princess of France has used earlier in the play to describe the King of Navarre and his lords. 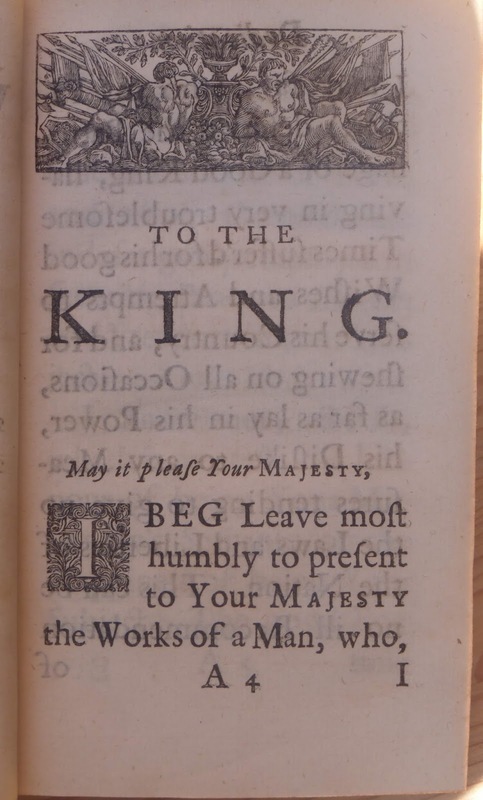 Boyet, the Princess's lordly attendant, also describes them as 'bookmates', a brilliant coinage which Shakespeare uses nowhere else. It suggests being mates with someone because of a shared taste for books, and also being mates with books. **** Shakespeare himself seems to share my ambivalence. The play begins with the King and his lords vowing to shut themselves away from the world (and especially women) for three years while they read. Shakespeare must have deeply valued his time spent alone with books. Yet in the play's second scene the Princess and her ladies arrive, and predictably the men start falling in love with them, and the limitations of book-learning are rapidly exposed.